The Trinidad Scorpion brings honor to its name. At first, when you eat it you cannot feel the heat directly. Don't be fooled, after a while the sting of the scorpion is felt and the heat keeps rising and rising. Finely tuned together chili breeds in a fiery-aromatic 'Limited Edition' Hot Sauce. This plant has extremely hot fruits. The plant has a strong growth and a high yield. ATTENTION: One of the hottest chilies In the world! The fruit with the "Scorpion stinger". The complete set contains instructions, fertilizer, seeds and pop up earth. Simply grow it yourself! The heat stings like a Scorpion – the flavour is fruity. Caution: Extremely hot. A rare Trinidad Scorpion with a typical heat but with a special color. The fruits turn caramel brown. Now in organc quality! Trinidad Moruga Scorpion, unofficial Heat World Champion with yellow fruits. Now in organic quality! One of the hottest chilies in the world. Trinidad Moruga Scorpion, unofficial Heat World Champion with yellow fruits. Trinidad Moruga Scorpion, unofficial Heat World Champion with red fruits. Now in organc quality! Trinidad Moruga Scorpion, unofficial Heat World Champion with red fruits. This plant grows extremely hot fruit. The plant has a strong growth and a high yield. 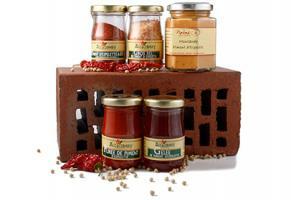 Organic seed variety - San Marzano sauce tomatoes seed set - 4 different varieties that give every sauce the perfect touch. Every variety contains 10 seeds. Trinidad Scorpion in 6 different versions! For the lovers of the extra hot Capsicum Chinense a top bundle! +++NEW+++ Trinidad Scorpion Caramel now also as seeds! Very hot strain of the Trinidad Scorpion Moruga. One of the hottest chilies in the world. 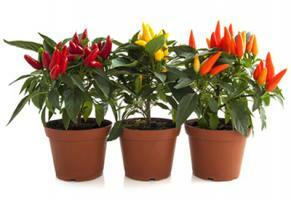 7 Pot - A classic under the super hots - here 4 exclusive varieties that are different for your wild chilli garden! Fresh Trinidad Scorpion - a interesting Chili from the SUPER HOT category. Stings with full power! NEW in Organic Quality! 5pc Set of the finest olive oils, straight from Italy, seasoned with the incomparable chili aromas. Double the amount of Trinidad Scorpion than the original and lots of fruitiness thanks to apricots, blueberries and carrots. This article talks about one of the world’s hottest chilies, namely the Trinidad Scorpion. Find out many noteworthy facts about this unusual chili strain. To which breed does it belong and where does it originate? This and many more interesting questions will be answered. Which strain does Trinidad Scorpion belong to? The strain to which this breed is counted is the capsicum chinense. Like most other representatives of this family, the Trinidad Scorpion is particularly fiery, and for good reason. It is one of the hottest chilies in the world, which even held a record entry into the Guinness Book of Records. Further characteristics of capsicum chinense are the bushy growth as well as the high yield which results from it. Another characteristic is the small size, as the plants only grow to a little bit over a meter. All capsicum chinense plants can be trimmed and moved inside for hibernation shortly after harvest. In this way the plenty of fiery chilies are assured for the coming year as well. Where exactly does the strain originate? The question is really not difficult to answer, because the name already reveals it. The place of origin thus lies in the island state of Trinidad and Tobago, more precisely in the Moruga region. For this reason, this chili is often referred to as Trinidad Moruga Scorpion. Trinidad and Tobago are part of the small Antilles and are located on the Eastern Venezuelan coast. To this day, the island is home to the main cultivation areas for the extremely fiery chilies. The strain needs special conditions! The strain likes warm temperatures. Air humidity should be high. Trinidad Scorpion is best suited for a greenhouse. A warm and sunny place will also work. Given the right care, the plants can also hibernate. 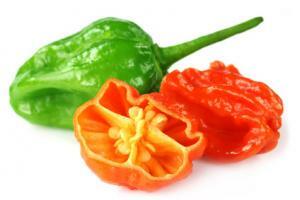 Which are the characteristics of the Trinidad Scorpion? The pepper is the size of a golf ball. The shape is reminiscent of a lantern. Trinidad Scorpion is very hot. The peppers come in a bright orange or red. How does this variety taste? As said, the Trinidad Scorpion is one of the hottest on the planet. On our scale, with which we determine the heat, it is in the highest place. It is not without reason that Trinidad Scorpion belongs to the so-called "Super Hots", the world's hottest chilies. However, strictly speaking, the heat is not really a sense of taste, but a simulated combustion that your body fights against. If you have survived the heat kick then you will be rewarded with a very fruity taste. This fruity-hot combination tastes really good. Due to this taste composition, the Trinidad Scorpion variety is often used for the production of hot sauces or salsas. Since Trinidad Scorpion is a thin-walled chili, it can also be dried and then ground. 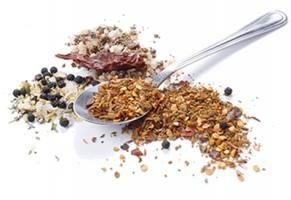 The fiery spice powder thus obtained is perfect for spicing up many different dishes. As always, your imagination has no limits in the kitchen. Yes, there are. The Trinidad Moruga Scorpion Yellow and Trinidad Scorpion Chocolate varieties are particularly popular with Chiliheads around the world. All these sub-varieties are based on a long breeding process. Of course, the other representatives are not inferior in terms of heat, since they are obviously from the breed capsicum chinese as well. The Trinidad Scorpion, like many other varieties of the breed capsicum chinense is also very hot. For some time, this variety was even the heat world record holder! For this reason, the peppers of this variety are also bright red or orange in order to warn predators. In addition to its heat, the Trinidad Scorpion provides a great, fruity taste. 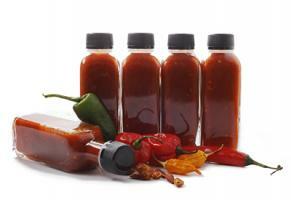 The fruity-spicy aroma is ideal for the preparation of hot sauces and salsas. The name reveals a lot about the Trinidad Scorpion, for example its origin. 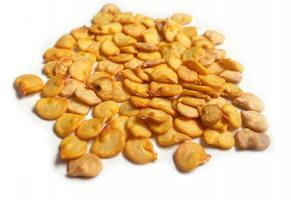 A special feature of the variety is undoubtedly the small, needle-like structure, at the lower edge of the fruit, which gave it the nickname "Scorpion". There are now several varieties available, thanks to intensive breeding, for example a plant with yellow and a plant with brown fruit. 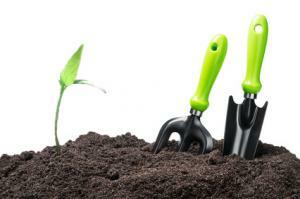 If you want to grow your own plants, for example with seeds from our shop, then you must provide the right conditions. The tropical climate can best be simulated in a greenhouse.